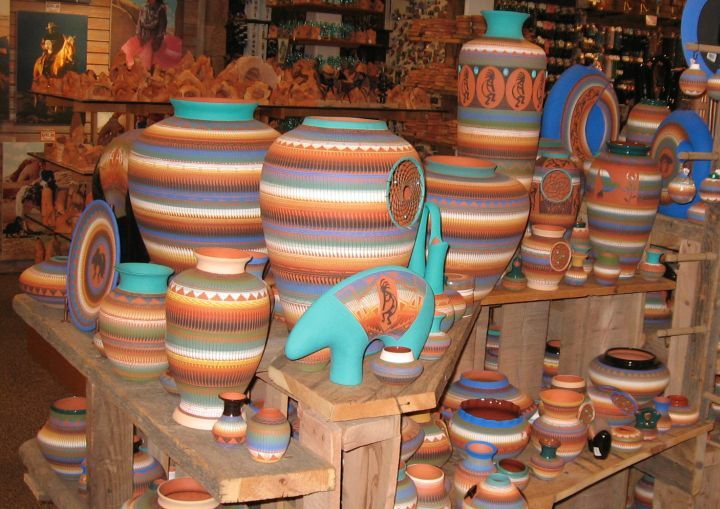 More than 60 award-winning artists will travel from across the Navajo Nation for a weekend of cultural immersion at the Museum of Northern Arizona’s 65th Annual Navajo Festival of Arts & Culture.. Ticket prices are $10 adults, $9 seniors (65+), $7 students (with ID), $6 American Indians (10+) and $6 youth (10-17). The event is supported in part by the Arizona Commission on the Arts with funding from the state of Arizona and the National Endowment on the Arts as well as the Flagstaff Arts Council with City of Flagstaff/BBB Revenues. Saturday, August 2, 9:00 a.m. – 5:00 p.m.
Sunday, August 3, 9:00 a.m. – 5:00 p.m.
jewelry – concho belts – sash belts – paintings – cradle boards – and many more. Preview is from 9:00 AM-11:00 AM and the auction will start at 12:00 noon and go until all items are offered to the bidders. Remember that the Navajo Reservation will be on daylight saving time. Native American food vendors will have available many traditional foods and the tent and park grounds will be occupied with many local traders and Native American vendors offering all types of art and crafts and the Trading Post will be open throughout the day as well as tours of the J.L. Hubbell homestead. The National Historic Site is located within the Navajo Nation in Ganado, Arizona near the intersection of Highways 264 and 191. 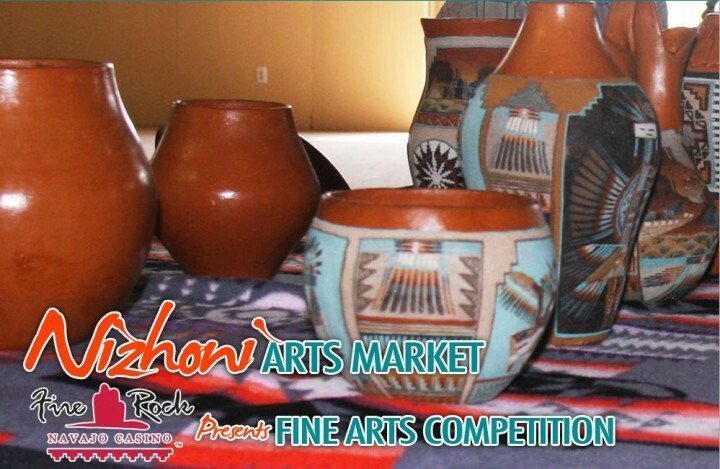 The FAC/NAM Committee will be accepting Art for Fine Art Competition on August 30th & 31st, 2012, from 10:00 am to 4:00 pm at Gorman Hall on the Navajo Nation Fair grounds. All work must be handmade by the artist within One Year Period of September 2012. The art to be related to the artist’s tribal affiliation. Artists are required to provide Certificate of Indian Blood (CIB) and Drivers License verification for age division. Each Artist Allowed Two Art Pieces for the Fine Arts Competition. 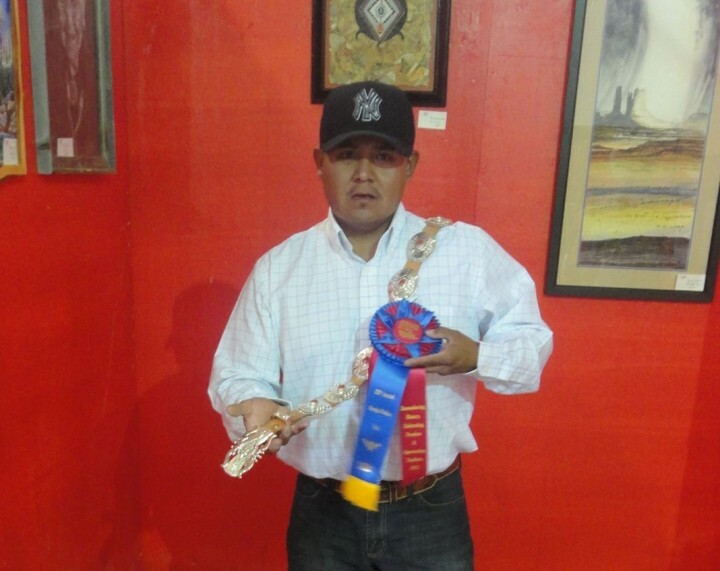 The artist to deliver art on August 30 & 31, from 10:00 am to 4:00 pm at Gorman Hall on the Navajo Nation fair grounds. The Navajo Nation Museum staff will be available to accept entries. NO entries will be accepted after 4:00 pm. A booth will be provided for the winner of Best of Show. The artist will need to be present at the booth that should to remain open Friday, Saturday and Sunday from 10:00 am. to 8:00 pm. & on Sunday from 10:00 am to 5:00 pm. Artists who have NAM booth will have their art returned after judging to display & sell at their booth. However, top winners art work will remain on display in the Fine Art Competition Gallery. Consignment art sale fee15% for art sold at the NNFAC to made payable to NNF FAC. Premium payouts by FAC Coordinator to be made on the following days: Thursday, Friday & Saturday from 2pm – 4pm. Prize awards not claimed will be forfeited by 5 pm on September 14, 2012. Artists and art will be photographed for winning categories. The photographs will be utilized for publicity purposes to promote the Navajo Nation Fair and the NAM. Fine Art judging to be held on September 1, 2012. Results to remain confidential until VIP & Media reception on Wednesday, September 6, 2012. VIP & Media only preview on Wednesday, September 5, from 1:00 to 3:00 pm. Absolutely no item(s) will be accepted if suspected to be of prehistoric or culturally sensitive artifacts is ruled by the museum staff. The use of materials, such as raptor feathers or endangered species is prohibited. Traditional, contemporary and evolving jewelry. No false representation of materials or origins will be tolerated. Commercially produced pottery, slip molds, or green ware are strictly prohibited. Contemporary pottery forms are acceptable. Hand coiled or wheel thrown are acceptable. Traditional & contemporary basketry made of natural fibers and the use of natural and aniline dyes are acceptable. Paintings, drawings and graphics MUST be framed and ready for hanging or will not be hung for display. Photography MUST be framed and ready for hanging or will not be hung for display or will not be hung for display. Framed or matted & shrink wrapped with proper hanging for display or will not be hung for display. Provide mannequin and proper hanging devices for display or item(s) will not be hung for display. Proper hanging or display devices to be brought in with art for display. The FAC/NAM committee has the option to hang or not due to space or inadequate hanging device. 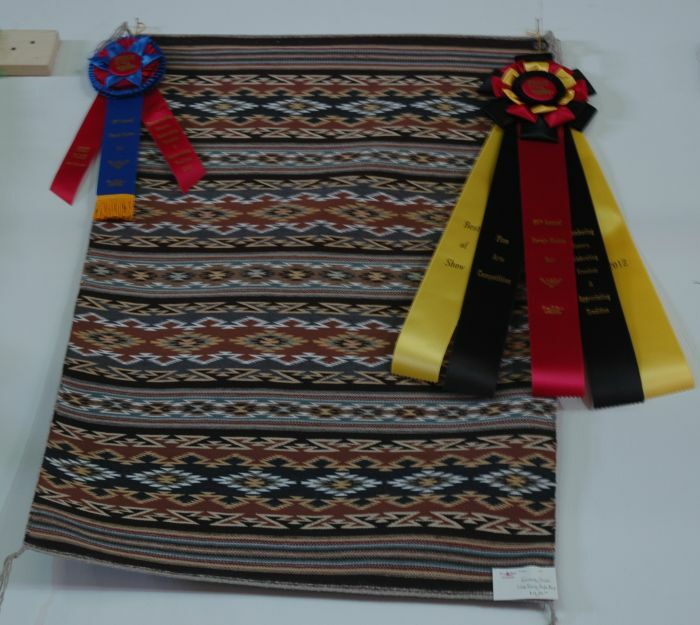 Textiles, blankets, belts and purses must be handmade and woven within One Year Period of September 2012 and entered by the weaver. All natural yarns and dyes are acceptable. Synthetic or acrylic yarn must be properly labeled. To include textiles, sash belts, traditional/contemporary clothing and all weavings. Sewing machine and hand stitched work is acceptable for all clothing. Stone, bronze and other metals are acceptable. Dolls in traditional categories must use materials historically associated with its native culture. Artists are not to display dolls of tribes other than their own tribal affiliation. Plastic beads or “bead stringers” and commercial tanned hide are allowed. Diverse Arts A category to recognize artist’s unique contemporary and multi-media work. A category to recognize artist’s work within their tribal traditions and utilize elements and components, handmade by the artist. Such items are personal attire, accessories, dolls, figurative, and functional objects such as; bows, arrows, cradle boards, boxes, knives, shields, furniture, lamps, beaded bottles, bandolier, bags, pipes, hide paintings and musical instruments such as drums, flutes, violins, etc. Art items that are identified as problematic due to the creation within a One Year Period of September 2012, and/or made by another artist will not be displayed and no award will be given. No Early Art Check Out! Art to be released ONLY to person with claim tag on Sunday, September 9th from 11am at Gorman Hall. 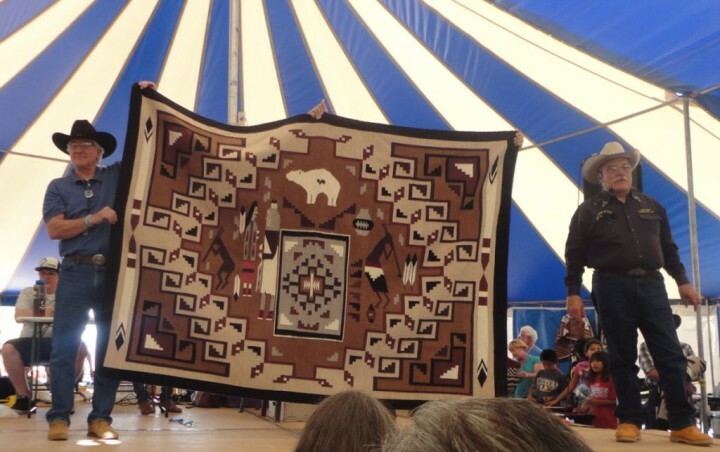 Liable for any lost, stolen art and injuries or accidents on Navajo Nation property. 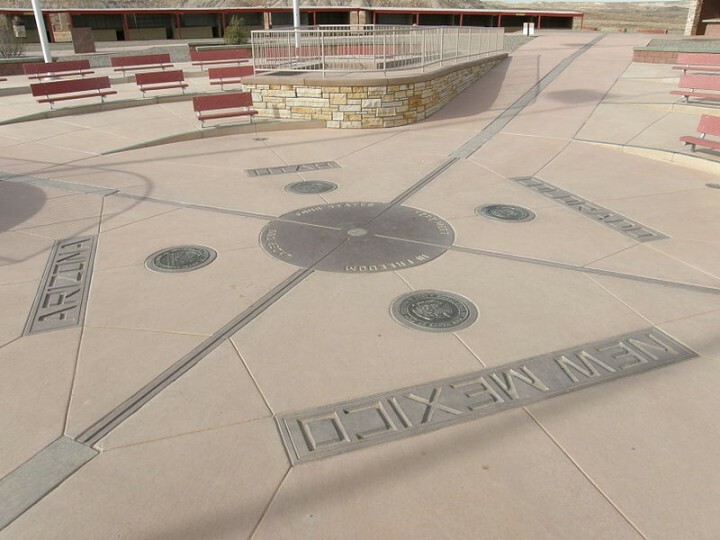 The Four Corners Monument is the only place in the United States where four states (Arizona, Colorado, New Mexico, and Utah) come together at one place. 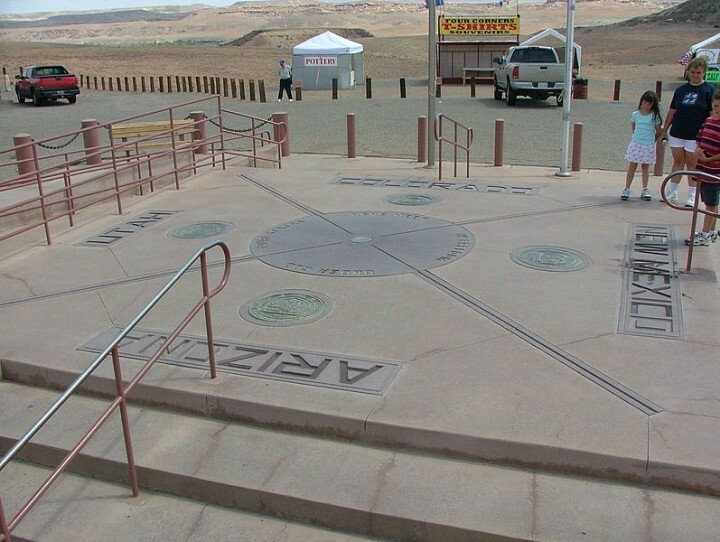 Here you can stand in four states at the same time. Photo by Harold Carey Jr. The monument is maintained as a tourist attraction by the Navajo Nation Parks and Recreation Department. 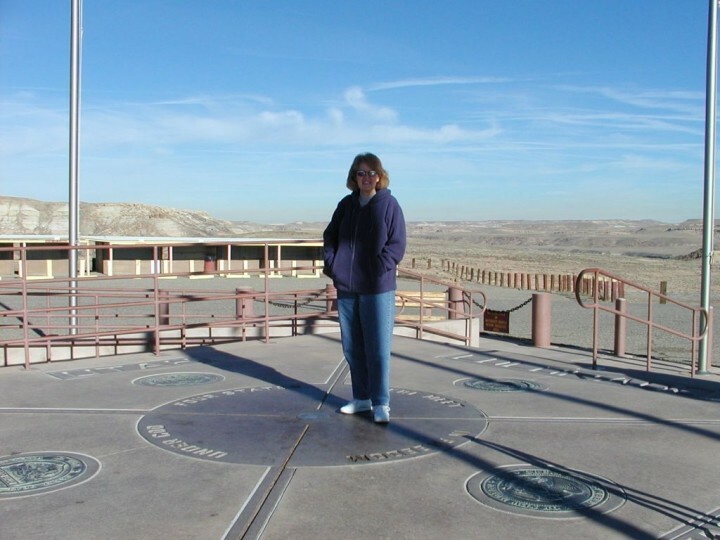 The Four Corners region didn’t always have such a clear-cut divide. Part of Mexico until 1848, the area has since been home to countless squabbles over state lines. The original marker erected in 1912 was a simple cement pad, but has since been redone in granite and brass. The Visitor Center is open year round, and features a Demonstration Center with Navajo artisans. Navajo vendors sell handmade jewelry, crafts and traditional Navajo foods nearby. Picnic tables and self-contained restrooms are available. Services and accommodations are very limited to small cafes, grocery stores and self-service gasoline stations within a 30 mile radius. We recommend that you have plenty of water, food, snacks, hand wipes and extra toiletries when visiting. The area is very remote, no running water, no electricity, no telephones. There is a small visitor center, which is open year round. 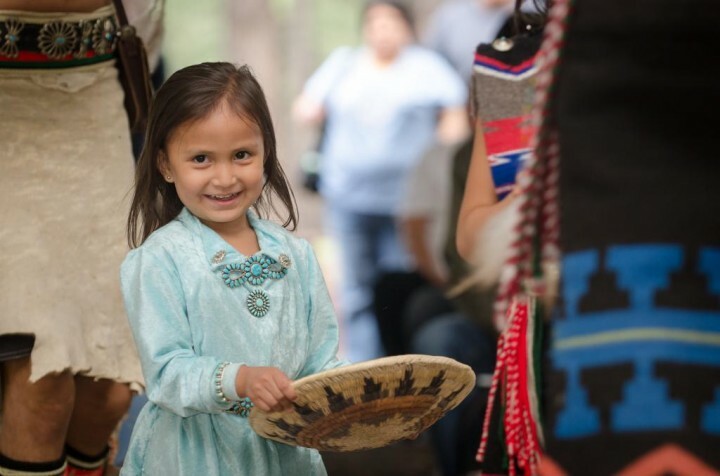 It features a Demonstration Center with Native American artisans. Vendors sell handmade jewelry, crafts and traditional foods nearby. Self-contained toilets are available. 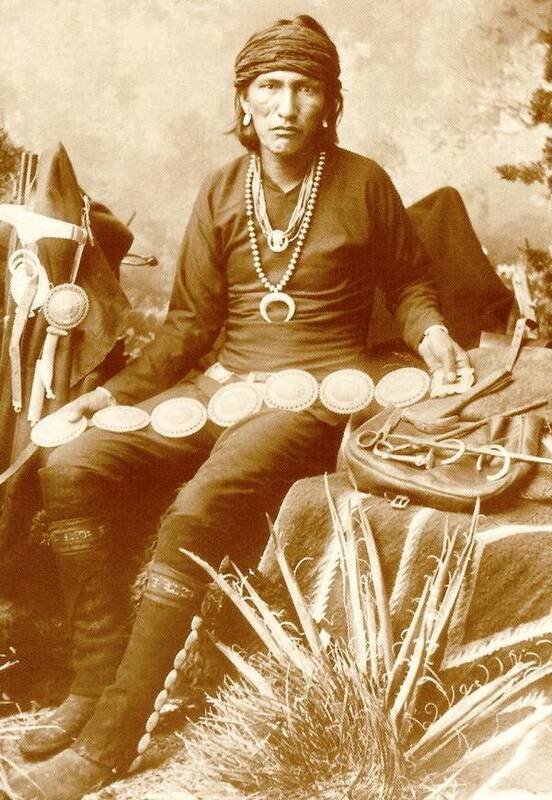 Among the Navajo Indians there are many smiths, who sometimes forge iron and brass, but who work chiefly in silver. When and how the art of working metals was introduced among them I have not been able to determine; but there are many reasons for supposing that they have long possessed it; many believe that they are not indebted to the Europeans for it. Doubtless the tools obtained from American and Mexican traders have influenced their art. Old white residents of the Navajo country tell me that the art has improved greatly within their recollection; that the ornaments made fifteen years ago do not compare favorably with those made at the present time; and they attribute this change largely to the recent introduction of fine files and emery-paper. At the time of the Conquest the so-called civilized tribes of Mexico had attained considerable skill in the working of metal, and it has been inferred that in the same period the sedentary tribes of New Mexico also wrought at the forge. From either of these sources the first smiths among the Navajos may have learned their trade; but those who have seen the beautiful gold ornaments made by the rude Indians of British Columbia and Alaska, many of whom are allied in language to the Navajos, may doubt that the latter derived their art from a people higher in culture than themselves. The appliances and processes of the smith are much the same among the Navajos as among the Pueblo Indians. 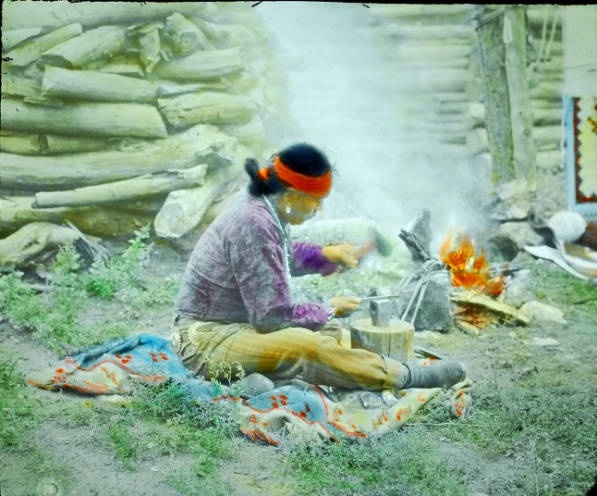 But the Pueblo artisan, living in a spacious house, builds a permanent forge on a frame at such a height that he can work standing, while his less fortunate Navajo confrere dwelling in a low hut or shelter, which he may abandon any day, constructs a temporary forge on the ground in the manner hereafter described. Notwithstanding the greater disadvantages under which the latter labors, the ornaments made by his hand are generally conceded to be equal or even superior to those made by the Pueblo Indian. A large majority of these savage smiths make only such simple articles as buttons, rosettes, and bracelets; those who make the more elaborate articles, such as powder-chargers, round beads , tobacco cases, belts, and bridle ornaments are few. Tobacco cases, made in the shape of an army canteen, such as that represented in , are made by only three or four men in the tribe, and the design is of very recent origin.